GIANT fortune cookie bigger than a baby's head! 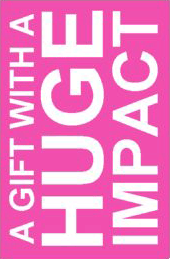 * Huge Cookie: 7" x 5"
Problems? Confused? 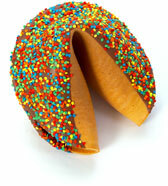 Talk to one of our Cookie Experts -- they're magicians at helping customers! 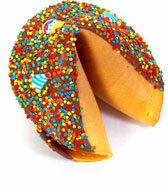 Our fortune cookies are baked with loving care, by hand in our Indianapolis bakery. Each one is made from the finest ingredients, including high quality Belgian chocolate. 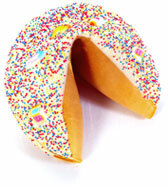 These are not cardboard-tasting fortune cookies like you’ve been served in restaurants. Nope, these dandies are flavored with fresh vanilla bean for a wonderful taste sensation. Have your giant cookie dipped in either white, milk or decadent dark chocolate, then add festive candy sprinkles, and you’ve chosen a present that won’t be forgotten. The unexpected size of these cookies may cause long-lasting smiles and gasps of joy - from birthday parties to boardrooms, from bachelor parties to baby showers. 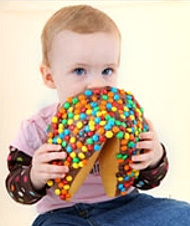 The list of ways to use giant fortune cookies is, well, HUGE! 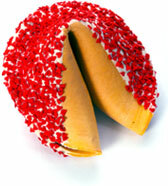 Your GIANT fortune cookie comes with a giant custom message 12" long! Copyright © FryTech Designs. All Rights Reserved.